Justices Will Decide Whether Workers Must Endure Unpaid Inconvenience : The Two-Way Some employees who worked for an Amazon fulfillment warehouse in Nevada had to wait nearly 25 minutes after each shift to be screened by security. They want to be compensated for that time. 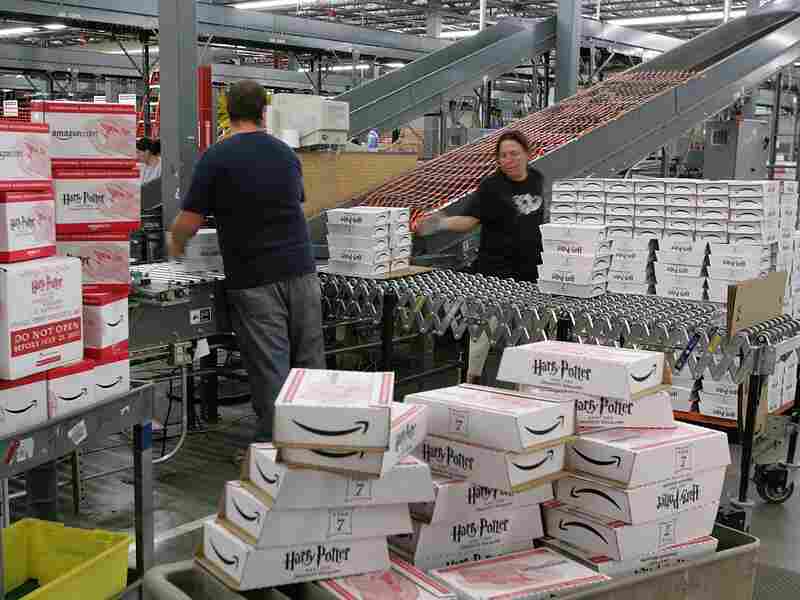 Employees pack copies of the new book Harry Potter and the Deathly Hallows for shipment in July 2007 at an Amazon fulfillment center in Fernley, Nev. Workers at the center filed a suit in 2013, seeking compensation for time spent in a mandatory security line after their shifts. The U.S. Supreme Court heard arguments Wednesday in a case that could affect millions of low-wage hourly workers across the country. At issue is whether federal law requires employers to pay workers for significant amounts of time spent in security screenings. Integrity Staffing Solutions Inc. is a temp agency that hires workers for many of Amazon's warehouses. The employees fill customer orders and package them to ship. But after the workers clock out, they have to go through anti-theft screening — a process that they say took an average of 25 minutes because the company set up just two screening checkpoints for 1,000 workers at the shift change in Nevada warehouses. The workers sued, contending that under federal law they should be paid for the time spent in the long screening process. Paul Clement, a solicitor general during the Bush administration, led off the argument on behalf of Integrity. He told the justices that under federal law, workers are not paid for clocking out or waiting to clock out, and therefore they should not be paid for the screening process afterward. Justice Elena Kagan interrupted with a question: Suppose you have an employer with an "extensive process for closing out cash registers" to protect against theft. Without the theft concern, you could close out the register much more quickly. The same would be true for bank tellers or casino employees: Instead of a couple of minutes, there would be a 20-minute anti-theft process. So, she asked, what's the difference "between that case and going through security at Amazon?" Clement seemed to suggest that in those cases, the employees would not be paid for their time either . "Couldn't you say," Justice Antonin Scalia suggested, that "closing down the cash register is part of the job," while "getting yourself inspected as you leave" is not? Clement readily agreed to the suggestion, but Kagan did not. "That would seem to make it depend on a complete fortuity," she warned. After all, you could have the cashier "take her tray" to the manager "on the way out the door." And you would end up with one answer at the cashier's station and a different one at the manager's station. "Is it irrelevant," Justice Ruth Bader Ginsburg interjected, that because there are not enough screeners, "what could be a five-minute process turns out to be 25 minutes?" Clement replied that it is irrelevant, though he pointed out that some people at the front of the line would be screened in far less than 25 minutes. Justice Anthony Kennedy focused the questioning back on the company. Isn't it "for the benefit of the employer" to hire fewer checkers, he asked, despite the fact that it causes long waiting periods for the workers? Clement conceded the point, but maintained that the time spent waiting in line still wasn't compensable. To qualify for compensation, he argued, the screening would have to be "indispensable" to the job — and Amazon could "perfectly well run a warehouse" without security screenings. "I don't think you can," interjected Justice Kagan. "What makes it Amazon" is a system of inventory control so good that it "knows where every toothbrush in the warehouse is." Opposing Clement in court and arguing for the workers, Reno-based attorney Mark Thierman told the justices that, once an employee clocks out, anything else that an employer requires is a work-related task that the worker has to be paid for, unless there is a specific carve-out in the law. Chief Justice Roberts observed that "the employer doesn't hire someone ... to go through security screening." It seems to me, he said, that "you're just saying [that] anything that is required for the benefit of employer" is an activity that has to be compensated. "A person is hired to do what they are told to do. That's your job," Thierman responded. And the employer has to pay for it, if it takes more than a trivial amount of time. Justice Stephen Breyer said that in a case like this, he normally would look to the Department of Labor, "and they say you lose." Thierman replied that the Labor Department's interpretation of the law in this case is inconsistent with its other rules that "define work as 'when you're under the control of and doing what the employer tells you to do.' "
Breyer followed up, asking for examples of other activities, similar to security screening, that are compensated. Thierman noted that workers are compensated for time spent in routine drug testing, and truck drivers are paid for time spent refueling their trucks at the end of their shifts. Chief Justice Roberts postulated that all of these issues likely would be addressed during the collective bargaining process, but Thierman noted that these are nonunion workers. Moreover, he said that most of these cases do not involve union workers. Thierman went on to argue that having just two checkers for 1,000 people at one shift change was Integrity's choice. It could have hired more screeners — as it did later, when it lost in the lower court — and cut the wait time to five minutes; it could have installed cameras on the warehouse floor; it could have searched employee work stations. But it picked the cheapest way to conduct the security screening, he said, without regard to the time it cost the workers. When he concluded his argument, though, it was not at all clear a majority of the court agreed the workers should be paid for their long daily waits.